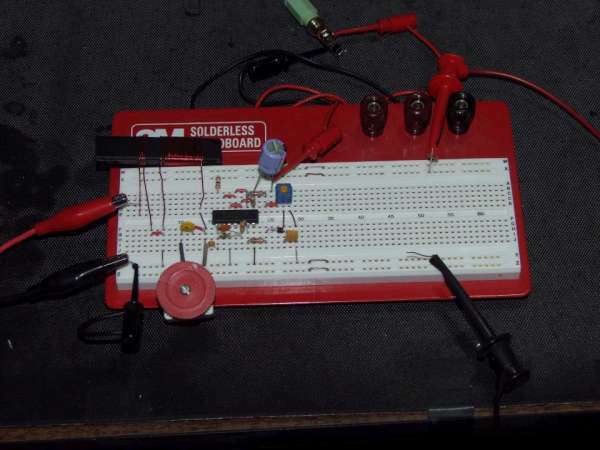 One unusual use for a logic chip is as an analog amplifier. Most logic with inverting outputs can be used this way. In order to demonstrate this functionality, I’ve built an AM radio with a 74HCU04 inverter. The inverters are used both as RF amplifiers and as audio amplifiers. It is capable of tuning any frequency all the way from VLF through HF if you change the values of the components in the tuned circuit, but I’ve built it to cover the AM broadcast band (540kHz through 1600kHz in North America). This entry was posted on Friday, October 21st, 2011 at 8:00 am	and is filed under 7400 contest. You can follow any responses to this entry through the RSS 2.0 feed. You can skip to the end and leave a response. Pinging is currently not allowed.